Guide and information of Japan travel, manga anime place, animation, otaku, naruto, evangelion, hello kity, Bandai, books and more. All about wine, not only French nor Italiano but some Japanese dew drops of "God" (^^) And Asakusa Beer Building has the Taiyo Beer Wine company (in the manga/anime/drama story). Virtual Reality becomes such exciting experience, especially for someone knows Virtual Insanity. Most advanced, featured, updated, newest, highlighted, popular, fresh, raw Manga-Animation is listed on LINE. It is fun and useful to learn the language if you devote your life into.......love life, then life will love you back! The town also has anImate cafe if you are not gint to Akihabara, Sendai, Nagoya, Osaka, Okayama and Fukuoka. You may confuse if this was Gandum!? Of course not! This is the iron man no.28, personally observed much "stronger" than the one in Odaiba, Tokyo. Located in once devastated by Hanshin-Awaji earthquake, this is the hope of standing up again from ground-zero. The dream come true shop for everyone! Rilakkuma, Miffy Style, Jackie's Marche, Blythe Dolls, Snoopy, Disney, Sanrio, Hello Kitty, Tomica and more. In downtown Tokyo, there are several shops, the leading one is Harajuku and Venus Fort in Odaiba, but also in Kichijoji near Ghibli Museum. After all, he is the God of Manga in Japan. Universal floating energy? Inner-Child? Urim and Thummim? Let's find out during our life time. It is not too late, we are still breathing alright, our responsibility is everywhere until we take the last breath, and happiness is always within ourselves. Hojo Tsukasa sensei is one of the best manga story writer. Now you can ride on izu-kyu-train with them! Manga wrapped train with their voice announcement are cute and awesome. Born from pear in Funabashi, Chiba. Stand next by me! This is one of the most major anime/toy/game company in Japan. Gundam, Precure, Ultraman, One Piece, Kamen Rider, Dragon Ball, you name them all, please! Shopping site is available at this page. You may download more than 2000 free animation movies from this site. Official hobby site is this. 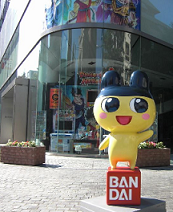 Also, there is a Bandai Museum located in between Tokyo and Nikko. One in thousand two hundred years? Have you met your spiritual partner in this life time? Hana-iro has the onsen ryokan story. Kanazawa also has Kenrokuen and 21st century museum. Wanna feel good with great song, Secret Base, by ZONE + SCANDAL (+ 10 years after ver.) together? lyrics is all about adolescent angst. Hope you'd catch the vivid meaning of Japanese language....... This is the one! Best heart-touched animation, the last episode of Menma available somewhre at Youtube if it were not deleted. She says her story is "give me a break, but let's enjoy" in her very fist comic book. Although, truth is that's what's happening in the universe (only if you could believe in it, it ain't no more fictions), and you may enjoy The Alchemist by Paulo Coelho, too. Death and Live are in One. Good always win over Evil, actually they are also in One. How many pages could you remember of your previous life? Do you sometime see "strange" dream, do you remember some of the dream of your young age, usually less than 10-year-old? Hope you find your own "notebook" to clear karma so that you will be able to step forward, in the end, you would not need to come back to "class room" or this world. Best crying animation. Let's visit west of Saitama to enrich our life, shall we! The full AFTER STORY song is here for todos. Vamos! This is one of the most famous game in Japan made by SEGA. Newest game is just released in 2011. If you could catch the opening of the original version, come to Japan to see the Sensouji Temple in Asakusa, you'll be alive in the games! TV official page is also available. This is the final love story of the earth. How can Shuuji love Chise, the normal high school student whose body is transformed into an ultimate weapon of war? Held in beautiful canal town of northern island. The house the couple live is Shibetsu station of JR Hokkaido. Jin made a Zen statue out of the shrine sacred tree. The goddess, Nagi, was born out of the wooden masterpiece. Miyagi is one of the prefecture which is hit by tsunami on March 11th, 2011. School comedy, but deeply related to Japanese spiritual fact. Kanpachi is the spin-off comic out of Kannagi. The kindergarden boy, Shinchan = Shinnosuke Nohara, is living in Kasukabe-shi , Saitama-ken, about 35km north of Asakusa. The trouble making boys and girls are based in real life there, and you may find their house, families, park, school and daily activities. The kawaii girl, Usagi Tsukino, transforms into a warrior in sailor outfit and tries to vanquish ghosts terrorizing Tokyo (story based on Azabujuban). Not only manga animation, but here you'll meet 5 cuties. Digimon is an adventure story in imaginary digital world, Tokyo. Seven children start first adventure one summer, followed by Digimon Zero Two. Set in a university town of Tokyo where 80 percent of the whole population (2.3 million) are students, one of whom, a super power girl, Mikoto Misaka, can wield bolts of electricity, and she solves cases throughout the city. Animation is available at this page. Tachikawa is 40 minutes JR Chuo Line ride from Tokyo central station, Tama Center is 40 minutes KEIO ride from Shinjuku station. Ponyo was created when Miyazaki Hayao san enjoyed staying few months there in the small village port, not far from Onomichi, which actually related to JiuFen in Taiwan (Sento Chihiro no Kami Kakushi) if you combine this Asian trips with Taiwan and Japan together in one candy. Mecca for bicycle riders, please ride Shimanami Kaido. The animation is originally made (not based much in the same named game) by P.A.WORKS in Nanto, Toyama-ken, north of Takayama or Shirakawago or Gokayama. If you cannot meet Shinichiro Nakagami, a boy main character in the story, or Noe, Hiromi, Aiko, Nakagami san, still you can feel the town there in reality. ANA has 6 round trips everyday from Tokyo Haneda Airport. Noh theater just 10 minutes walk from the Toyama Airport is highly recommended apart from the animation. Many of the scenes in the anime feature beautiful shots of the scenery in Toyama. It is not special talented person who save the world, but just a normal person who you encounter in everyday life. The story is about Jinnouchi families along with Kenji, Takashi, Natsuki and Kazuma, officially held and supported by the real town called Ueda in Nagano-ken. JR East has Shinkansen access from Tokyo and Ueno. You may hit this page (JR East Nagano Branch) for the local information, please. Global crisis, internet space, time journey, Sanada samurai and more, but the highlight is the entrance to the Jinnouchi family's residence, the Higashi-Koguchi Yagura gate of Ueda Castle. On your way to Yudanaka Onsen where monkeys are enjoying onsen life, you will be also relaxing in authentic Japanese style house (now guest house with nice modern restaurant) at Kura. Welcome to Japan already, please pay a short visit at the shrine illustrated in the story. Ryouougakuen school is actually this school in reality called Kasukabe Kyouei High School (good combination trip along with CRAYON SHINCHAN). Hiiragi families are living in the shrine called Washinomiya Shrine which is 5 minutes walk from Washinomiya station on Tobu Line, about 50 minutes train ride direct from Asakusa (Tokyo Skytree Line and Isesaki Line is directly connected with through-train service). The story is about the laid-back everyday lives of 4 cute unique spirited girls, Konata Izumi, Tsukasa Hiiragi, Kagami Hiiragi and Miyuki Takara. Reminds you those good old days in your local high school, you bet. As family name tells, Tsukasa and Kagami are sisters at Hiiragi house (their father is the priest of the shrine). Together with Kasukabe city (due to Crayon Shinchan, the other animation), this Kuki city is also well known by anime-otaku (anime-fan). No need to explain these stories that much popular to the world. It was Shinji's 14 year-old life to pilot the humanoid mecha Evangelion and stand against a series of mysterious enemies called "Angels". Shinji with Rei and Asuka and a some adults from NERV. Together they fight to defeat the "Angels" in a battle that will decide the fate of the Earth. This series has Tokyo-3 which is set near Hakone, a place in Kanagawa-ken known for its onsen (hot springs) and majestic view of Mt.Fuji. EVA lovers must not miss Owakudani (between Sounzan and Togendai), Kintokiyama or Kintokisan and Ashinoko (Lake Ashi), please! This Mt.Fuji viewd amusement park is guaranteed to leave you speachless, breathless, to make your blood boiled. There are mainly screaming machines like Six Flags, but also a number of attractions related to the Evangelion series. Access is here and highway view (especially the red-colord line from Otsuki JCT to Subashiri) is fantastic if you took the Fujikyu highway bus from Shibuya or Shinjuku. This museum is all about Hayao Miyazaki and the works by Studio Ghibli (pronounce as Jibli, J as in Jeep, a bit of Japanese language lesson?). Kazenotanino Naushika, Tonarino Totoro, Mononoke Hime, Tenkuno Shiro Rapyuta, Hotaruno Haka, Majono Takkyubin, Omohide Poroporo, Mimiwo Sumaseba, Sento Chihirono Kamikakushi, Ponyo and more! They are not only manga animation but the universal spirits in them! No time to visit Tokyo, but would love to work in animation at Toyota (Kaizen and Just-In-Time) in Nagoya? Ride on the "Cat Bus" and find the way! Perfect location inside Inokashira-koen park and zoo. World famous Sanrio characters Hello Kitty, Kiki Lala and more. Who does not like?